To make deliveries at many facilities truck drivers must have personal protective equipment with them, otherwise they will not be unloaded. 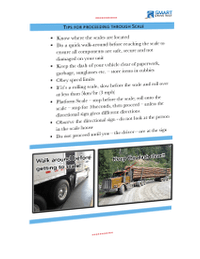 Your PPE, your personal protective equipment - that which you need to have in the truck with you, or the bus, particularly truck drivers more so because you are going to travel into timber mills, other big industries, and construction site to deliver loads that you are going to need your personal protective equipment. If you don't have your PPE, you are not going to be allowed into the timber mill to make your delivery, onto the construction site, or the big industry where you need to go in. PPE will allow you access into timber mills, big industry, and on the constructions to make deliveries. Often as a truck driver. This really isn't relevant to most bus drivers—little bit for bus drivers, but not for the most part. First thing you're going to need, safety boots. You're going to have to have boots that have steel toes and a steel shank in the bottoms, so that nails and other sharp objects don't come up through and puncture you in the feet. They are designated as safety boots by the green triangle on the side with the CSA emblem on it. Those are the approved safety boots that you have to have. Now for a lot of truck drivers you learn how to drive with running shoes on because we find it easier to teach truck drivers how to drive with running shoes and they don't wear with boots. If you don't want to wear them while you're driving at least have them in the truck. Next thing you're going to need to get into a timber mill, or one of these union places to make deliveries is the hard hat—doffing the hard hat there! Not likely that something is going to fall on your head, however, the hard hat is really good at keeping the rain off your head. The next thing you're going to need is a pair of safety glasses. You only get one pair eyes; you lose one…well, then you’re one eye from blind. So safety glasses always wear your safety glasses. Next thing: hearing protection. Some of these places will require that you have hearing protection. You don't have one of these is bulky, you can go and get those little styrofoam ones that twist up and go in your ear. They work really well and they're not very expensive at the at the dollar store, or the hardware store or what not. Most truck drivers and bus drivers however, will always, always, always need a pair of gloves. We encourage you to wear your gloves outside of the vehicle… whatever you're doing: loading luggage, moving freight, hooking up the trailer, because protects your hands “A”. Nothing worse than a metal sliver, I'll tell you that! ‘B’, it keeps the dirt outside of the vehicle not in the vehicle! If you’re not wearing gloves outside the vehicle your hand gets all dirty—you go in and put it on the steering wheel. All that grease is transferred from outside the vehicle into the vehicle. so pair of safety gloves. You need a safety vest, rather, so you can be seen on the job site and it is less likely that you're going to be involved in a crash with other people operating machinery in and around where you are going to be unloading. So the safety vest is the final piece that you're going to need. So in conclusion, PPE—personal protective equipment that you're going to need in the vehicle with you. • work boots—certified work boots. You're going to need all of this in the vehicle with you, so that you can get out of this job sites and into these places that have high safety records. The other thing, some of these places - like DuPont that I went to in Tennessee you will have to be trained in safety and watch the safety video for about 20 minutes before they actually let you on the site.